KARACHI: What is the first thing that comes to mind when someone mentions Karachi? Bombs, target killings, or perhaps, gunny bags? The city was, after all, famously, or infamously, termed “Pakistan’s dark heart” by Time magazine. Some 320 students, however, aim to change that perception by capturing 70,000 photographs from around the city, which were later shortlisted, to document the incredible diversity of Karachi. 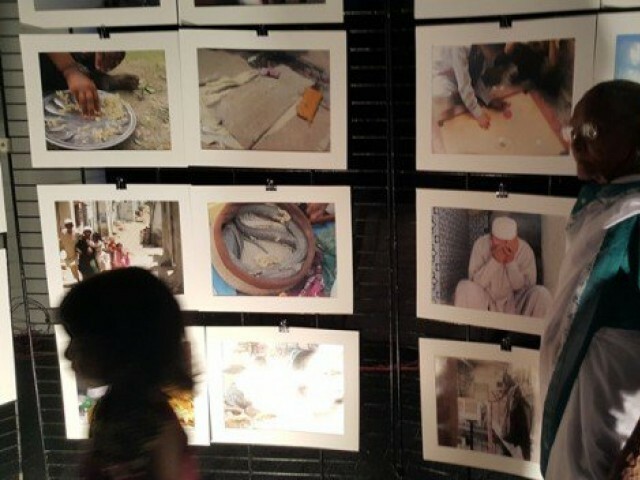 A two-day photography and travelogues event titled ‘I Am Karachi Museum’ was organised on June 12 and June 13 June at Alliance Francaise de Karachi in collaboration with I Am Karachi and The school of Writing, featuring photos and travelogues of students belonging to different districts of the city Karachi. A brainchild of the I Am Karachi team, the event, which featured the four-weekend activities participated by students who photographed the city’s districts, was organised to “give the youth of the city an opportunity to explore their city as many youngsters have apparently been going astray when they get used by criminals, drug-dealers and gangsters,” said one of the facilitators of the 4-weekend project. To give the event an authentic feel, organisers created a ‘Dhaba’ style tea-shack at the venue. Afreen Hussain, a participant from Malir, said she was not aware of how much importance perspective had in photography before. “I have learnt a lot from this four-week project. I had never written a poem before, nor did I know how to write one. Thanks to this project, I was also taught writing,” she said. Among the exhibited photos were shots of fortune-tellers who make their pet parrots pull out the envelope, found mostly in the old-city area; a female vendor selling dry fruits outside Empress Market; an ageing loader at the Railway Station; a fisherman mending his fishing net; a tired cobbler; a smiling ‘gola-ganda’ vendor with his pushcart, among many other sights. Asked if the four-week project was organised to give the younger generation a sense of ownership of their city, Mohsin Tejani, the founder of The School of Writings and member of the I AM Karachi team, answered in the affirmative and said, “I think there are three steps of this process: awareness, interaction and ownership. People from different areas, religions and cultures within the city do not know each other. They do not know what temples, churches, Imam Baras are located in the city and where. This breeds intolerance. How can they own the city in this situation?” asks Tejani. “If we do not interact, we won’t be able accept and understand others. And this project has tried and managed to do that,” he adds. Tejani told The Express tribune that the students were surprised to discover many captivating places in their own districts. Visiting places like Hanuman Mandar, Essa Nagri, churches, Gurdwaras proved to be an inspiration. “I remember the time when I was a kid and would go to the yearly organised ‘mela’ at St Lawrence’s church in the Garden East. No one asked me what sect or religion I belonged to. Those were the old times. This project has tried to bring those days of ownership, acceptance and tolerance back,” he says. The event also featured authors Asif Farrukhi, Haseena Moin, and Shandana Minhas, who recited their work.